Figure 1. Section drawing shows thread balls in contact with pitch line of internal thread. MTG Inc decided to look for answers by studying one of the most successful methods of gaging external threads, the 3-wire system. No one had ever seriously considered this system for internal threads before because it was obvious that the physical characteristics of wires made it impossible to deploy and seat them in the tight convolutions of a female thread. But the principle was sound, so MTG Inc overcame the physical problems by substituting floating balls of Best Wire sizes for the actual wires. Held captive in caliper fingers and mounted on an indicating gage frame, the balls could be made to simulate three-wire inspection in internal threads (Figure 1). The use of balls, incidentally, eliminates perhaps the only significant shortcoming of wires. The problem is spelled out in Screw Thread Standards for Federal Services, under the heading Limitations of Three-Wire Measurement of External Threads: "When the lead angle and diameter of a thread are such that double contact of the measuring wires occurs, it will be necessary to check the pitch diameter by means of balls rather than wires. For accurate measurement with wires, single contact on each flank must occur. Measuring wires can be used if the following formula is satisfied for a specific thread." Then follows a lengthy compensation formula developed by Werner F Vogel. Because of the possibility that wires may make double contact in threads of certain lead and diameter combinations, Vogel's equation calls for increased gauging pressure to seat the wires; as much as 2.5 pounds (1.13kg) for a 1/2"-20 UNF thread. This may result in deformation of wire and thread. Replacing the wires with balls as MTG Inc has done eliminates seating problems by making spheres rather than cylinders the method of contact. Gaging pressure need be only about 1 ounce (0.03kg), or enough to satisfy the inspector that contact pressure is sufficient to register the size. To understand how the ball principle isolates thread aspects for errorless measurement, let us first consider the key dimension in any thread; the pitch diameter. By definition, the pitch diameter is an imaginary cylinder along which each cut thread and each web of intervening metal have the same width: one-half the pitch, or P/2 (pitch divided by 2). Traditionally, the pitch diameter has been checked with thread plug gages. If an inspector could enter the "GO" plug but not the "NOGO", the pitch diameter was considered to be within tolerance. Should the "GO" fail to enter; general practice is to deepen the cut until it did. Conversely, should the "NOGO'' enter, the cut is made shallower to prevent its entry. The blind spot in this procedure is ASSUMED perfection in all other aspects of the internal thread. It ignored the fact that a thread cut to perfect depth will gage undersize if there is lead error, because the mismatched leads of the thread and the plug gage will have interference. By the same token, a thread cut oversize and having lead error can pass thread plug inspection if the interference is not enough to block the "GO" but does prevent the "NOGO" from entering. Figure 2. Floating action of the balls cancels out pitch errors in the metal between cuts (V) whether the error is minus as at (A) or plus at (B). The floating ball system cannot be deceived by errors in lead or helix, no matter how severe or erratic (as in drunken threads), because the balls float laterally to find a perfect seat in the cuts regardless of the width of the metal between cuts (Figure 2). The balls are grade 10 solid carbide, finished to Best Wire sizes, and will positively establish the accurate pitch diameter measurement since they measure diametrically across the threaded hole from cut to cut, not from cut to metal. What is the importance of gauging from cut to cut? Simply stated; all diameters of an internal thread are functions of depth of cut. The cut is the constant; an exact matrix of the cutter at every point along the thread. The metal between cuts; however; is an unknown remainder whose P/2 (pitch divided by 2) width is a linear function dependent on the accuracy of the lead. A lead with a plus error will widen the metal between cuts; a minus error will narrow it; an erratic lead will result in inconstant widths. Unless the lead has been proved perfect in advance, checking the pitch diameter by using the metal as a gauging point is futile. With the ability to isolate and accurately check the pitch diameter it becomes a simple matter to inspect the remaining thread factors one at a time; isolating extraneous errors at each step. In the MTG Inc system, the same gage frame is provided with additional pairs of fingers; each with a separate function. The MTG Inc system is so accurate it can be used to certify solid-style thread ring gages on the job. In the MTG Inc system; much thought has been given to the elimination of normally inherited errors. The gage does not measure. The gage compares the work piece against an accepted reference, such as a plain ring gage or gage blocks, and shows any variation on a dial indicator or electronic comparator. The measurement fingers move in one plane only, along the axis of the indicator, so no radial or angular "scissors effect" errors can be introduced. Problems of taper and out-of-round will not fool the system because its point-contact fingers reveal such conditions by displaying various readings when they are moved from one location to another around or along the thread. Repeatability of the MTG gage is excellent since there is nothing to change successive readings except surface contaminants. Careful cleaning of critical parts can overcome this. Thread plug gages can neither isolate compound errors in female threads nor reveal the amount of error. They merely suggest that something is wrong. The MTG Inc system lets the producer of internal threads make his own step-by-step analysis with this hand-held gage in a few minutes. Required data is obtained by use of interchangeable fingers shown in the chart below. Most significant of the fingers is ''J'', which contains two floating balls of Best Wire Size'. These balls make contact at the P/2 (pitch divided by 2) width, or pitch circle of the thread grooves. Because they float in their pockets, the balls will seat at the pitch circle whether the lead is short, long, correct or drunken. Finger "J" is used in conjunction with every upper finger in the thread series except the "Functional", and provides an identical base line in every case! Figure 3.. Floating action of the balls cancelled out pitch errors in the metal between cuts (V) whether the error is minus as at (A) or plus at (B). Fingers "A" and "J" both contain grade 10 tungsten carbide balls with the Best Wire Size. These two fingers give a reading which excludes lead error but not angular errors. Pitch Diameter fingers can be used interchangeably for right hand or left hand threads. Use fingers "A" and "J" at intervals along thread for taper and around the thread for ovality. Use fingers "D" and "J". The ball in "D" is smaller than in pitch diameter finger "A", and should seat a prescribed distance deeper. If it does not, angular error is present. The degree of error and its effect on PD can be determined by a formula. Use fingers "B" and "J"
Opposite finger "J", use "E"; then either "F" or "G". "E" has full flanks, while "F" and "G" are limited to 0.1H contact. Where half-angles are unequal, the thread groove will be tilted, and ''E'' will seat more shallow because its broader contact surfaces will meet greater interference from the tilted groove. The degree of tilt and its effect on PD is available through thread specification publications. Concentricity between minor and PD. is measured by using fingers "C" and "J~ and rotating the workpiece or gage. Minor diameter size, roundness and taper are checked with a pair of "C" fingers. Paired fingers "C' are helically ground for a single PD., pitch/lead combination which will measure the net effect of all errors. The MTG gage is set "over the balls" or "over the crests" with gage blocks, micrometers, super micrometers, or plain cylindrical ring gages. No threaded masters are needed. The pitch diameter setting equals the pitch diameter (low, nominal or high) plus the ball radius. The ball diameter is etched on the pitch diameter fingers. Functional fingers are marked with a specific setting size (example: OD 0.7501). Paired minor diameter fingers are set exactly to the minor diameter size. When a single minor diameter finger is used opposite a ''J'' finger to check concentricity, no precise setting is required. All contacts (except minor diameter) that are used opposite contact "J" are marked with a constant (CO) dimension (examples: CO+0.0214; or CO-0.0251). Setting size is equal to the pitch diameter setting plus or minus the constant dimension. 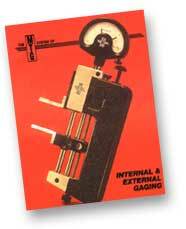 The basic internal gage frames are available in two models. The G-600 with a capacity from 0.190 inches to 5 inches basic and the G-1200 with a capacity from 6 inches to 18 inches. The gage frames are extremely accurate, 0.000050 inch repeatability is guaranteed. The system was designed to take the abuse of shop use although it is precise enough for the requirements of the quality control or metrology laboratory. Two extension kits are available. The G-600X increases the capacity of the G-600 frame to 6 inches basic and the G-1200X increases the capacity of the G-1200 frame to 24 inches basic. The gauging pressure of both internal frames can be adjusted by the operator from maximum to negative pressure thereby allowing very thin wall parts to be measured. MTG offers more sizes, types, and reaches of internal fingers than any other gage manufacturer. Fingers can be manufactured to measure most every thread form including Unified, Buttress, Acme, Stub Acme, Metric, Whitworth, Lowenherz, Ball, 40 Degree Worm, Aero, and Square. Additional geometries are available for bearing races, grooves, bores, tapered bores, gears, splines, and dovetails. Six different lengths are available. MTG now enables the operator or quality control inspector to accurately measure internal tapered threads. No tapered set masters are required. Simple L1 location setting is designed into the system. The system can be hand-held or stand mounted. Fingers are available to measure pitch diameter, functional diameter, minor diameter, included angle, and full form (single thread) on 60 degree tapered threads. The MTG Telescoping Tube System (TST) is far more accurate than its competitors who use long segments that bend and deflect. The system can be used on either the G-600 or G-1200 internal gage frames. The reason for its accuracy is the fact that it creates a "Linear" measurement. The TST System uses TST inserts which are available in all the geometries listed for the internal fingers. Diameters as large as 36 inches or more may be measured. There are three standard lengths available, 5 inch reach, 8 inch reach, and 10 inch reach. Only with the MTG System can a bore diameter, internal groove diameter, and their concentricity to each other be measured with a single gage and set-up. This capability is due to the "MTG SQUARING PLATE" accessory. Four different squaring plates are available. All plates are slotted through their centers permitting the use of all our internal fingers. Squaring plate arms are adjustable for length so the reach of the fingers into any bore can be set to the desired dimension. Banking the workpiece against the squaring plate keeps the workpiece straight, so it is necessary to rock it in only one plane to find the high point of the diameter. The squaring plate may be moved in or out to permit gaging at any depth. After bores have been inspected for diameter, the gage is quickly reset to groove diameter and the squaring plate moved to a point that sets the fingers for groove location. Next, reset the indicator, then proceed with gauging. With the gage still set for groove diameter, rotate two eccentric pins mounted in the squaring plate. Slide the plate until the pins bear down against the bore, taking the stationary finger out of contact with the groove. Since the upper finger is now reading the groove while the eccentric pins are reading the bore, rotation of the workpiece will cause the indicator to show any runout between the two diameters. Anti-deflection braces are recommended when using 0.000050 graduation mechanical indicators, electronic heads or where an error might be suspected because of the awkwardness of accessibility involved when measuring the part. Anti-deflection braces are available in 5 different lengths for internal fingers only. They are not necessary when using the TST System. MTG offers a setting fixture for the G-600 internal gage frame. This fixture enables the operator to readily set the G-600 frame when finding the "ideal" size when there are two axis to consider. It is especially helpful when setting the gage with gage blocks or plain cylindrical rings. The fixture itself is manufactured to gage specifications and uses the same mechanism that is used in our internal gage frame. MTG offers simplicity in measurement. Many times it is necessary for the user to measure more than one element of a thread. Shown is an Internal System for thread measurement. The first gage is set up to measure the pitch diameter, the second gage measures the diametrical equivalent of the form (single thread), and the third measures functional diameter. The gage stand shown (three risers) is a GS-3. Two risers is a GS-2. One riser is a OS-1. The OS-1 is expandable to either a GS-2 or GS-3 simply by purchasing additional risers because all three stands share a common base. A round base (GS-O), is available which holds one internal frame and is used when measuring grooves and bores. Inserts "A" and "J" both contain balls of Best Wire size, and give a reading which excludes lead error but not angular errors. The PD. inserts can be used for both left hand and right hand threads. Use inserts "A" and "J" at intervals along the thread for taper, and around the thread for ovality. Use inserts "D" and "J". The ball in "D" is smaller than that in Pitch Diameter insert "A", and should seat a prescribed distance deeper. If it does not, angular error is present. The degree of error and its effect on PD can be determined by using a formula. Opposite insert "J", use "E"; then either "F" or "G". "E" has full flanks, while "F" and "G" are limited to 0.1H contact. Where half-angles are unequal the thread groove will be tilted, and "E" will seat more shallow because its broader contact surfaces will meet greater interference from the tilted groove. The degree of tilt and its effect on PD. is available through thread spec. publications. Use inserts "B" and "J". Concentricity between major and PD is checked by using inserts "C" and "J", and rotating the workpiece. Major Diameter size, roundness and taper are checked by a pair of "C" inserts. Paired inserts "C' (functional) are Helically Manufactured for a single PD/Pitch/Lead combination. A separate pair is required for each combination. The MTG gage is set "between the balls" or "between the crests'' with gage blocks or plain master pin/plug gages. No threaded masters are needed. The pitch diameter setting equals the pitch diameter (low, nominal or high) minus ball radius. The ball diameter is etched on the pitch diameter inserts. Functional inserts are marked with a specific setting size (example: ID 0.7501). Paired minor diameter inserts are set exactly to the minor diameter size. When a single minor diameter insert is used opposite a ''J'' insert to check concentricity, no precise setting is required. The inserts are brought into contact with the workpiece and the indicator is read for runout. MTG now offers twenty-two different external gage frames, ranging in capacity from 0.190 to 18 inches and special sizes are available with greater capacity. All OD inserts are interchangeable with all external frames. All external frames have capacities in 1-3/16 inch increments. GOSR-2 for ranges from 6 inches up to 18 inches in diameter. The GOSR-2 gage frame has a 2 inch reach and approaches the screw thread from the end of the part. GO series has a range from 0.190 to 10 inches. The GO series gage frames approach the screw thread from the side, along the length of the part. Many of our customers have requested some type of rest or fixture to place the gage frame in after measuring the part on the machine. Many times the gage was either knocked on the floor or someone inadvertently placed objects on the frame. MTG developed the LGR Gage Rest Fixture to solve this problem. They will not scratch the gage frames and are adjustable within their range. LGR-3 which has a capacity from 6 inches to 23 inches. MTG offers simplicity in measurement. Many times it is necessary for the user to measure more than one element of a thread. (Shown is an External System for thread measurement which contains three different size frames. This is only to display the size comparison and would never be desired to be combined in this fashion.) The first gage is set up to measure the pitch diameter, the second gage measures the diametrical equivalent of the form (single thread), and the third measures functional diameter. This is a non-professional video posted to give a general idea of how this gage is used. Please forgive the non-professional aspects of it.